It's Wedding Season at the Old Caledonian! Ahh. The flowers are blooming, the birds are singing and the bees are buzzing. At the Old Caledonian, that means wedding season is upon us! Amazing spaces– Our gazebo and grounds are known as being among the most picturesque settings in this entire region. 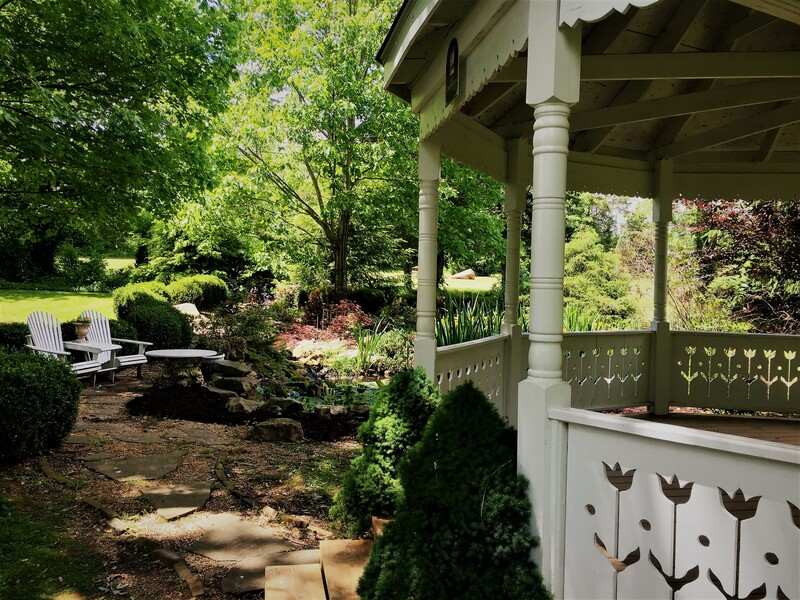 From the sounds of the brook leading to our koi pond, to the four acres of pristine grounds dotted with stunning photo ops, it’s undoubtedly gorgeous. We can seat up to 32 people with an aisle in our stately gazebo, and upwards of 100 on the surrounding lawn. We even supply up to 100 white folding chairs for your use. Bride’s Room– One of the stars of the show for sure is our incredible Bride’s Room, which is dedicated to the preparation of br ides and their attendants for the big event. 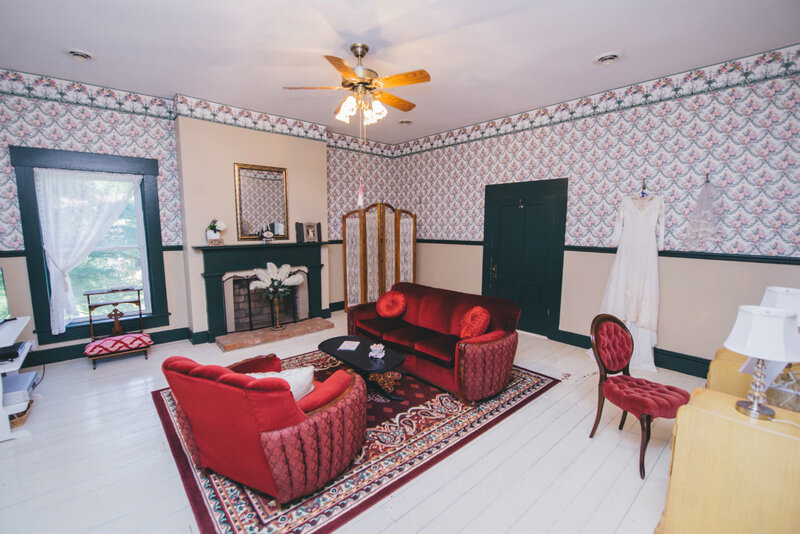 The room has three lighted make-up stations set upon vintage tables; clothes hooks all about the room; a screened changing area with full-length mirror; and luxurious antique furniture for relaxing before the wedding. We even have a DVD player with wedding themed movies in the Bride’s Room just for fun. It’s a truly spectacular space, and it is included when our wedding facilities are rented for the day. And, our downstairs Library is perfect for grooms and groomsmen to get ready for the day, too. as part of your stroll over to the barn! The Caledonia Barn books upwards of a year in advance, so please plan accordingly. Combine a viewing of the barn with a tour of the Old Caledonian B&B and an afternoon of shopping in Caledonia! The Caledonia Barn may be reserved by calling Lily at the Village of Caledonia at (573) 779-3492. Cost– Our prices are among the most reasonable in the area for the use of the Old Caledonian for weddings and events. The cost of the use of our wedding facilities, which includes the Bride’s Room, the Library, the Parlor, the Gazebo, and our grounds for photography, is $700.Why are we less expensive than many other places? Because we provide the space, and you provide the decorations, the placement of the chairs and the cleanup. We’ve found that most people actually prefer this control over these aspects of their event, and we provide the value to back it up. If you prefer to use our grounds rather than book the Caledonia Barn (or any other location), the added cost is $300 (this includes use of the grounds only; not tent, tables or other rental costs). We have a wedding contract which details all aspects of the use of the Old Caledonian for weddings and events so both your expectations, as well as ours, are clear. Jon in his wedding officiant attire. 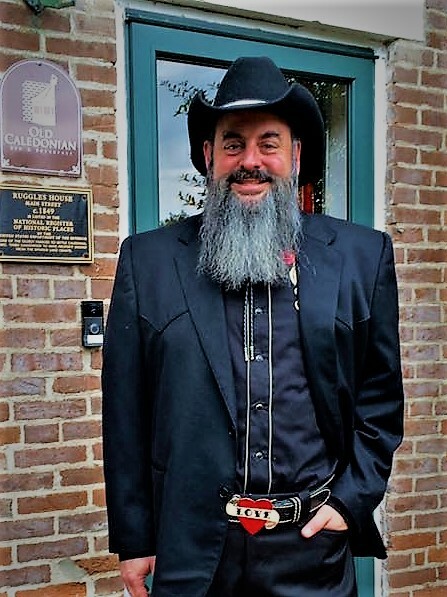 The Old Caledonian’s In-House Officiant- Jon, one of the owners of the Old Caledonian Bed & Breakfast, has been a certified wedding officiant since 1989! He has performed countless weddings over the past decades and would be happy to perform yours. His standard ceremony is a bit unconventional—it is a fun, boisterous and inclusive celebration that gets everyone involved in the festivities. He can certainly perform more conventional ceremonies upon request. If you’d like to see a video of Jon performing a wedding, please email us and we will send you a link. The cost to have Jon perform your wedding ceremony is $150. 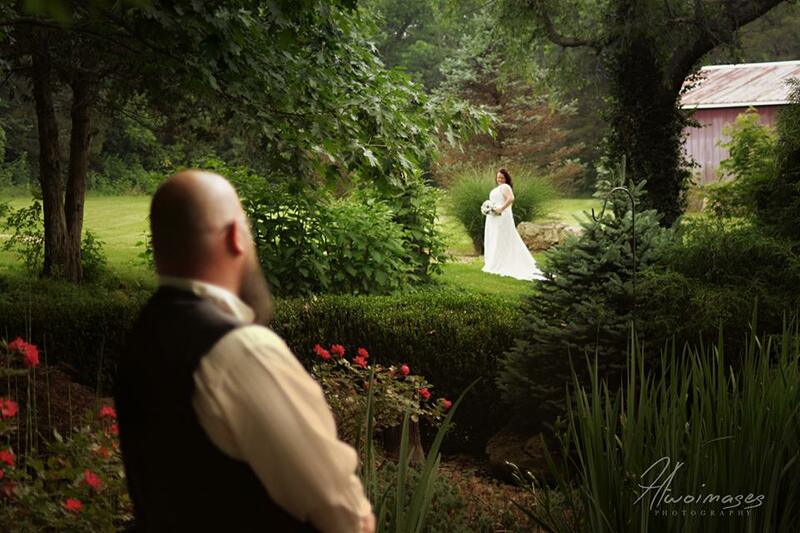 If you’re looking for an amazing spot to have your wedding, we offer you congratulations and an invitation to consider the Old Caledonian Bed & Breakfast for your event. Cheers! It is a wonderful scenic wedding venue. We had a wonderful time there and the pictures are wonderful. Thanks you for the kind words, Bonnie! We are so happy you had a wonderful time at the Old Caledonian.